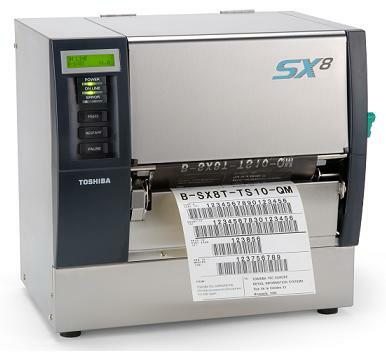 The B-SX6 and B-SX8 wide web printers from Toshiba with RFID functionality and powerful networking deliver outstanding performance for a wide variety of environments and applications. These innovative industrial printers offer advanced features including extremely fast processing, large internal memory, web printer controls, outstanding SNMP networking tools* and RFID options. Utilising ground breaking CPU technology from Toshiba the B-SX6/8 models offer high-speed printing and enhanced processing via an extensive choice of interfaces - including USB and internal LAN. The options of serial, wireless LAN and RFID interfaces provide additional flexibility and choice, making these printers adaptable to the widest variety of environments and applications. All Toshiba products are manufactured at Toshiba’s own facilities providing the assurance of complete reliability and quality of key components essential for low overall cost of ownership. To lower the cost of ownership further the B-SX6/8 printers have large internal memory as standard with no requirement for costly PCMCIA boards or ATA memory cards. All of Toshiba’s new generation of thermal printers for the industrial environment are RFID ready. This provides not only essential flexibility for the end-user to choose the RFID module that best meets the needs of their business and suppliers, but also ensures a future proofed printing solution that can evolve and grow with the future demands of the organisation.